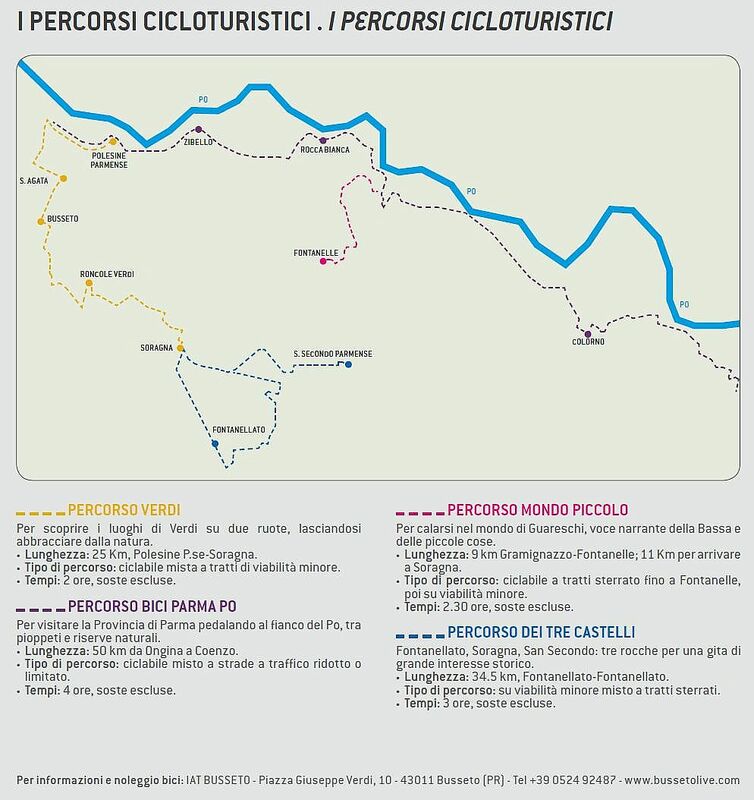 For bicycle lovers, the Lands of Verdi represent an ideal territory for cycling, since they are crossed by numerous cycling trails that allow you to discover the fluvial ecosystems of the Great River, but also the many villages of the lowlands, their history, and their people. This small corner of the earth is haunted by the spirit of the famous composer Giuseppe Verdi whose unmistakable notes mingle with the tales of Guareschi, the speeches of Faraboli, the cinema criticism of Pietro Bianchi and the voice of Carlo Bergonzi. A short break around these parts can really leave a mark on those who venture there. 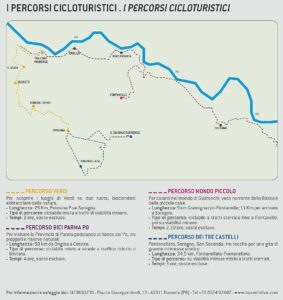 The routes are different, and there is something to suit all tastes: for lovers of history, for lovers of fine food and wine, or for those who, more simply, just want to enjoy a relaxing break surrounded by nature in among the majestic poplar groves or along the endless wide shores of the Po. Lo IAT di Busseto mette a disposizione 8 biciclette, di cui 4 da uomo e 4 da donna ed in più 2 seggiolini per bambini con i relativi caschi. La tariffa per il noleggio è di € 7.00 per la mezza giornata (massimo 3 ore), e di € 14.00 per la giornata intera (massimo 9 ore) .